Congressman Kurt Schrader often works across the aisle to pass legislation. He joined Republican Cathy McMorris-Rodgers, far right, and Rep. Greg Walden, not pictured, to pass H.R. 3144 to protect Northwest consumers from higher electricity bills. Photo courtesy of the office of Kurt Schrader. 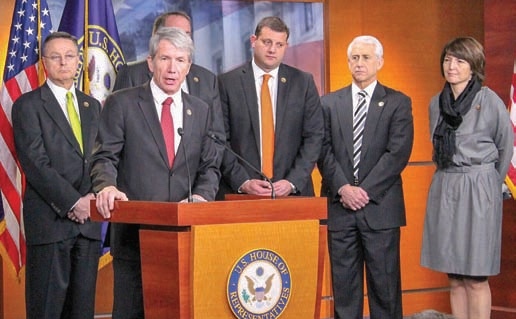 Oregon Congressman Kurt Schrader is not only playing a key role for electric co-op consumers, he is on a bipartisan roll on the floor of the U.S. House of Representatives. In a Congress cleaved by partisanship and gridlock, Democratic U.S. Rep. Kurt Schrader legislates from a seemingly bygone era. By shedding labels and staking out an independent middle ground, the five-term Oregon congressman is passing consequential bills with bipartisan support. In fact, Schrader is on a bit of a bipartisan roll, particularly with important natural resource issues that affect grid reliability—and the pocketbooks—of electric cooperative consumers in his diverse 5th Congressional District. This Congress, Schrader—a member of the powerful House Commerce Committee—played an important role in keeping the lights on for Oregon’s electric cooperatives that cross lands controlled by federal agencies such as the U.S. Forest Service and Bureau of Land Management. Earlier this year, the U.S. Congress approved—and President Donald Trump signed—an omnibus appropriations bill that, among many provisions, streamlined the vegetation management process for utilities and land management agencies. The vegetation management reforms were based on bipartisan legislation (H.R. 1873) Congressman Schrader spearheaded with Republican Congressman Doug LaMalfa (CA-1). It will improve what has been a frustrating process for utilities such as Consumers Power Inc. The Philomath-based cooperative serves 22,000 members in six counties. It often faces frustrating bureaucratic delays maintaining its rights-of-way for reliability and compliance with state and federal laws. Passage of this legislation was hard fought. While vegetation management reform had been debated for several sessions, the proposals floundered as opponents labeled them as an excuse to harvest trees on federal lands. But that all changed in June 2017 when H.R. 1873 was debated on the House floor. These arguments carried the day. H.R. 1873 garnered a staggering 300 votes, including 70 Democrats—many of whom are Schrader’s allies in the Blue Dog Coalition, made up of centrist Democrats. 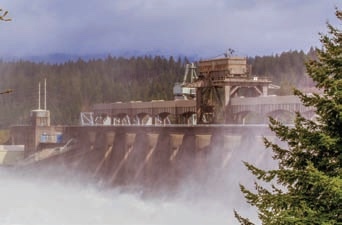 According to the Bonneville Power Administration, the state of Oregon’s controversial plan to spill more water over dams for fish will increase costs for Oregon consumers and could harm juvenile salmon. Photo courtesy of BPA. In a U.S. Capitol where party line votes are as common as tourists at the Lincoln Memorial, the bipartisan passage of H.R. 1873 caught many D.C. insiders by surprise. It did not, however, surprise those who worked closely with Schrader in Congress, including former Utah Rep. Jim Matheson, current CEO of the National Rural Electric Cooperative Association. Consumer-owned utilities in Schrader’s district, such as 19,000- member Salem Electric, depend on the clean, renewable hydropower sold by the Bonneville Power Administration. However, the Federal Columbia River Power System has been subject to non- stop litigation as some environmental groups and the state of Oregon have sued to advance a controversial plan to spill more water over eight dams on the Columbia and Snake rivers for juvenile fish passage. The result of this litigation is to leave operation of a complex river ecosystem to a federal judge. BPA declared that spilling more water over the dams could cost consumers $40 million a year and emit 840,000 metric tons of carbon because renewable energy will have to be replaced by market purchases that can include fossil fuels. This Congress, Schrader joined Republican Congresswoman Cathy McMorris-Rodgers (WA-5) to introduce legislation (H.R. 3144) to take a timeout on additional spill and maintain the federal government’s scientifically rigorous 2014 biological opinion. The 2014 BiOp, a product of federal fisheries scientists spanning the Bush and Obama administrations, dictates how to best balance the hydro system for fish and power production. H.R. 3144 was debated on the House floor in April. “Mr. Speaker, it is time to put science back in the decision-making process for Oregon and Pacific Northwest salmon recovery strategy,” Schrader told his colleagues. Despite opponents labeling H.R. 3144 the “salmon extinction act,” the bill passed the House by a comfortable margin, with Schrader again bringing along a group of his Democratic colleagues to offset losses by House Republicans. With a political environment increasingly defined by party labels, Schrader’s unique approach to legislating may yield him the simplest of monikers. He will just be known as the Congressman who gets things done.